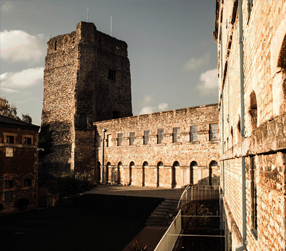 Macbeth begins at Oxford Castle Unlocked on Monday 31 July, presented by Siege Theatre. 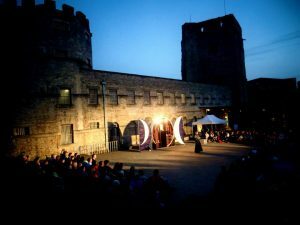 We spoke with show Director Michael Speight about his creative process, how he chose Macbeth as this year’s production and why Oxford Castle is such a great venue to enjoy theatre. I began dabbling in theatre around 10 years ago. I was lucky enough to find myself working within a commercial touring venue, without actually knowing I had an interest that ran deeper than enjoying other peoples work. During this time I got an opportunity to shadow a director and enjoyed the experience immensely. I began to seek out people who worked in amateur theatre locally and found a group I very much enjoyed interacting with. From there I began co-directing, producing and then putting on my own shows. On paper there’s a pretty clear template that you can use when putting on a production. The difficulty is in the nuances each task throws up and the balancing of time and creativity. First and foremost you need to pick a show. As this is the Oxford Shakespeare Festival we have a finite (in breadth if not depth) pool to choose from. But even with just 38 possible options, selecting the right one isn’t always easy. We look at the potential for interpretation, the cast needed, the competition (we make every effort not to double up and pick a play being performed by someone else in Oxford) and we also consider the commercial potential of the piece. We then put out a casting call and hold auditions (the selection of actors is vitally important and will shape the final piece more than anything else). From this point we allocate around 3 months to be ready to perform and begin rehearsals in earnest. We cover character development, the structure of scenes, pacing, blocking and many more things beside, all in order to bring the play alive and ensure it is entertaining for our audiences. While rehearsals are ongoing we begin to consider, costume, props, set, sound and lighting. We have an amazing team that helps shape this and pull it all together. Theatre is an ever changing feast of ideas, creativity, challenges and fun. I love how dynamic it allows me to be and love watching other creatives push themselves in search of the most enthralling outcome. It’s fast paced and requires you to open up to failure in order to come out the other side clutching the answers you went in search of. It’s not for everyone but I’ve found it the perfect environment for me. How did you decide on Macbeth? As mentioned above, there are a few things we look at when selecting our play. To focus quickly on three I’d say you can’t avoid considering the quality of the piece (yes, even Shakespeare has some bad plays! ), the scope for interpretation and the commercial potential. The better the writing, the better the final product. Shaklespeare’s most revered plays are considered so highly because they allow for continuous staging and scrutiny and rarely come up short. Taking something like Macbeth, you automatically grant yourself a foot up on almost any other play in existence. Our job is to do it justice and faithfully present the means imbued in the text. This strength of story also opens up a piece like Macbeth to reinterpretation. The writing has stood the tests of time because it holds themes within it that are eternal. The task of each new production is to make the words relevant and have meaning to their audiences. We spend a great deal of time on this very point before settling on a play. Finding that new way in is the key to unlocking all the latent potential of the creatives involved. Set them lose on an idea they love and something spectacular happens. I think this is a question all the Festival directors would no doubt answer in roughly in the same way. As a practical space it is beautiful, vast, grand and versatile. It allows a director to think big and present big themes. It is also so beautifully designed that you know you can draw an audience’s attention to something small and they will not miss it. From a more existential prospective, it has so much history and culture in its own right that your play is naturally knit up in a past bigger than itself. 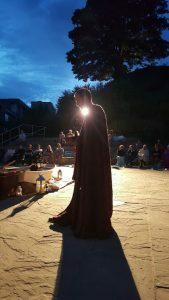 Audiences get a triple whammy when they see theatre at the Castle and it’s a joy to be a part of it. Book now to get your ticket to Macbeth! The production runs from Monday 31 July to Saturday 12 August from 7.30pm in the historic castleyard.